Nothing makes me feel as cozy in the wintertime as cassoulet. What is cassoulet? I guess you could call it a fancy French version of pork and beans. It doesn’t taste anything like our American pork and beans, though. Cassoulet is traditionally made with pork sausage, pork, goose, duck, sometimes lamb, pork skin, and white beans, as well as duck or goose fat. They typically use duck confit or goose confit. Duck confit is a French dish made with the leg of the duck (although confit is also made with geese and pork). 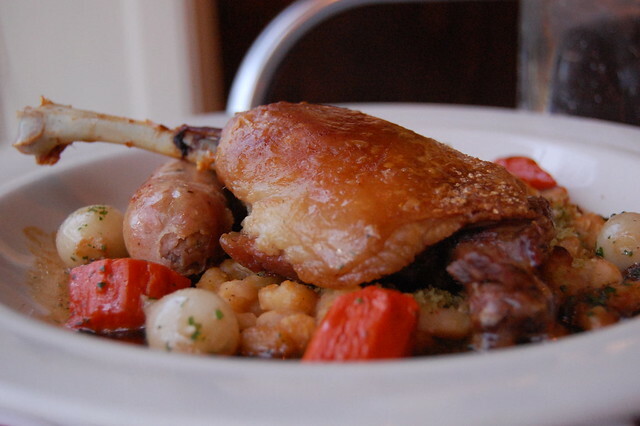 The duck legs are cured in salt, and then poached in its own fat. This was a traditional way to preserve meats. Duck confit is optional in this recipe. You could also use leftover roast pork, roast ham, or roast duck or chicken. You can also serve some sourdough bread with butter if you like. 1. Place the beans in a large glass or ceramic bowl. Add the whey and cover the beans with warm filtered water. Cover and allow the beans to soak overnight, and up to 24 hours. The next day, rinse the beans and set aside. 2. Heat 2 tablespoons of the duck fat in a 6-quart pot over medium-high heat. 3. Peel the garlic cloves and finely mince, and push through a garlic press. Peel the onions and carrots and chop. Add half of the minced garlic, onions and carrots to the pot and cook until lightly browned, about 10 minutes. Add ham hocks along with soaked beans and about 6 cups of fresh, filtered water. Bring to a boil. Reduce heat and simmer beans until tender, about 1 1/2 hours. 4. Transfer ham hocks to a plate; let cool. Pull off meat and discard skin, bone and gristle. Chop meat and add to beans. Set aside. 5. Heat 2 tablespoons of the duck fat in a 5- quart Dutch oven over medium-high heat. Cut the pork shoulder and pancetta or bacon into 1-inch cubes. Add the pork cubes and brown for 8 minutes. Add the pancetta and cook for 5 minutes. Add the remaining garlic, ions, and carrots. Cook until lightly browned, about 10 minutes. 6. Tie together oregano, thyme and bay leaves with kitchen twine. Add to the pan along with the tomatoes. Cook until the liquid thickens, about 8 to 10 minutes. Add wine and reduce by half. Add the chicken stock and bring to a boil. Reduce heat to medium-low. Cook, uncovered, until liquid had thickened, about 1 hour. Discard herbs, and set Dutch oven aside. 7. Meanwhile, sear duck legs in 2 tablespoons of duck fat in a 12” skillet over medium-high heat for 8 minutes, if using. Transfer duck to a plate. Next, brown sausages in the fat, about 8 minutes. Cut sausages into 1/2- inch slices. Pull duck meat off of bones. Discard fat and bones, or save for another use, like stock. Stir duck and sausages into pork stew. 8. Heat oven to 300 degrees. Mix beans and pork stew in 4-quart earthenware or glass casserole. Cover with breadcrumbs and drizzle with remaining duck fat. Bake, uncovered, for 3 hours. Raise oven temperature to 500 degrees, and cook cassoulet until crust is golden, about 5 minutes. Yum!! This looks so good, and sounds great! I am going to give cook it this weekend. loves me a good cassoulet!! !